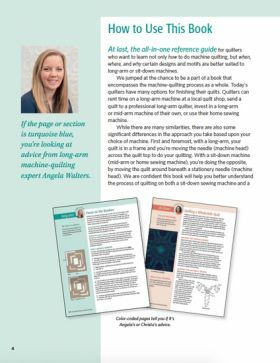 The Ultimate Guide to Machine Quilting is focused on giving the readers tools that will help to make us all better quilters. 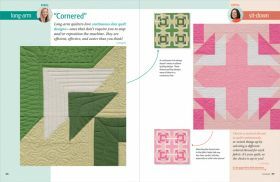 Angela Walters tells us that “Just as your handwriting is different from everyone else’s, your quilting designs will reflect your own style as well.” (14) This idea is imbedded throughout the book as the reader is offered multiple options for each featured quilt top. 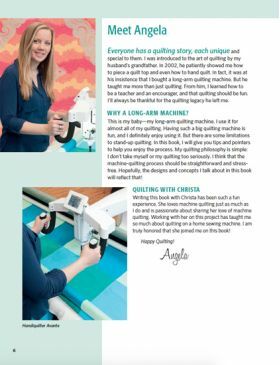 The book moves fluidly between longarm quilting techniques with Angela Walters and sit-down machine quilting with Christa Watson. 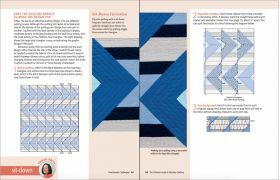 By having two different perspectives collected into one excellent resource, we are able to see multiple approaches for quilting the same pieced quilt top. Just as important, Christa and Angela also discuss the limitations of each type of quilting. Not every design is appropriate for longarm quilting, and not every design is easily achieved on a domestic machine. 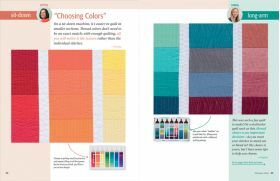 Pointing out these differences helps the reader to understand both the limitations and the possibilities of each type of quilting. 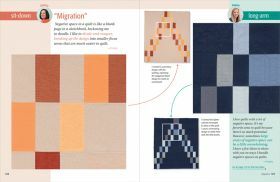 Combining the work of these two superbly talented contemporary quilters makes this book a reference that will be used consistently by readers for years to come. It will be a valuable addition to any quilter’s library. 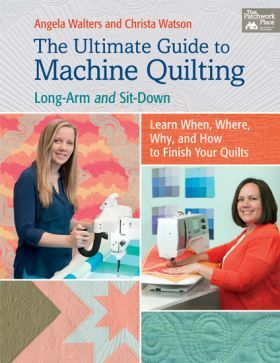 As a machine quilter who uses her regular sewing machine to quilt, often with rulers, to quilt designs often inspired by Angela and other long-arm quilters, this book is a great combination. Both are wonderful instructors and I love the color-coded split format. There's a lot of substance to this book for the beginner and the experienced quilter alike, and it's always fun to see how the same project is quilted differently by different quilters. I consider myself an advanced beginning machine quilter and am always looking for inspiration and direction -- this books delivers both. 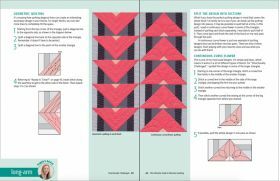 There are 10 quilts in the book (with instructions to make each), and lots of tips on how to successfully quilt each one. Not only do the authors show you a variety of designs, they go a step further and show you the best way to start and stop each design. A great quilting resource book. While I can piece a killer quilt top, actually quilting them on my home machine has been a bit of a struggle for me; but I am determined to do it myself and what better way then to learn from two award-winning experts. 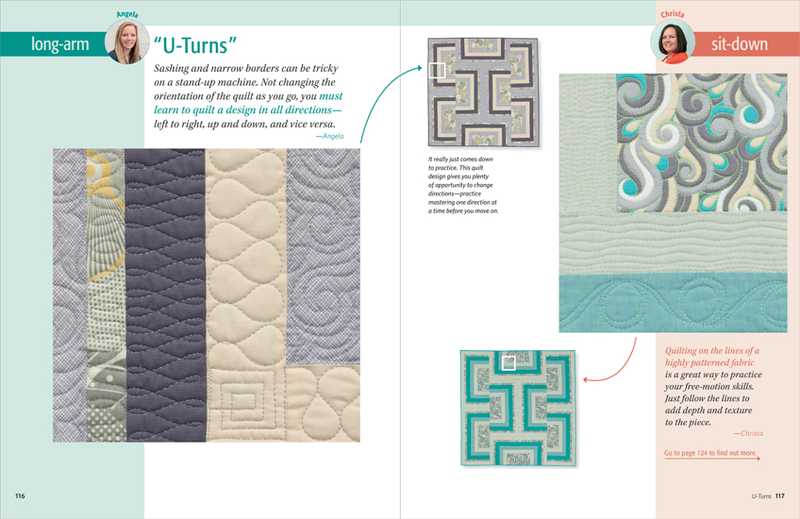 The tips, techniques and examples shared in The Ultimate Guide to Machine Quilting are right up my alley and I can already see this book being one that I come back to time and again. The variety of designs is extensive and in varying levels of difficulty; which means that people of all skill-sets will find this a helpful resource. 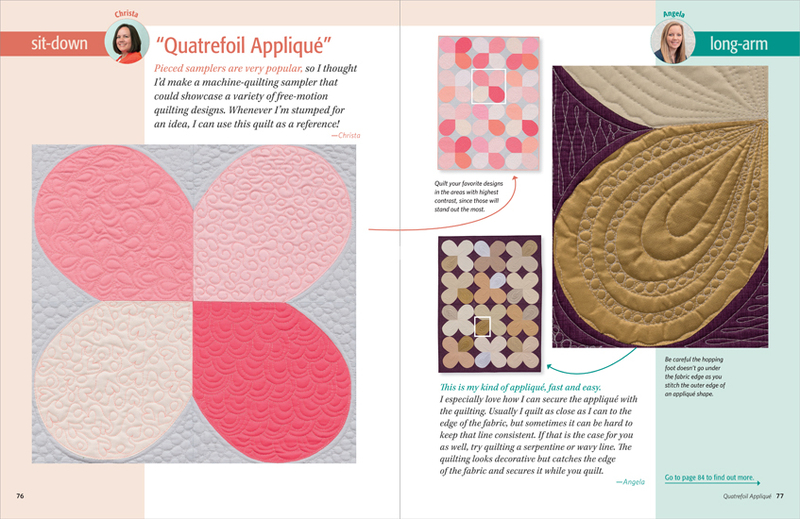 I love how this book combines both long-arm-quilting (by Angela Walters) and home-sewing-machine quilting (by Christa Watson) ideas and discusses why some designs and motifs are ideal for sit-down quilting while others are better suited to long-arm quilting. I was great to see the same quilt design made in two colorways quilted, each quilted differently. This book is full of quilting inspiration and easy to follow instructions, great for beginners and more advanced quilters! Each of these books is a two for one special in and of itself! That was a total shocker! So instead of it just being, “here’s a quilt top, let me show you how to quilt it,” there are full instructions on how to make said quilt tops, and then multiple instructional suggestions on how to quilt them. Now, keeping it real, many of the quilts are pretty basic in design. I can’t see myself making any of them, but there were a few that gave me an interested pause. 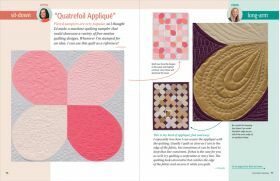 That being said, appliqué is introduced in both books, and these basic designs do allow prime settings for practicing quilting styles and patterns. 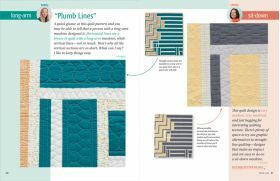 Regardless, you’re really getting bonus quilt patterns (that many will love!) in books that are only required to teach you about the quilting process. I’m not a quilter extraordinaire, but after reading these books, I kind of want to be, and more oddly, think I could be. The overall tones from Christa and Angela are ones of empowerment, encouragement, and endearment. Both authors make their readers feel like they are invested in their learning, regardless of what stage or level of the process they’re attempting. They just want you to quilt, and enjoy the hell out of it. You can also tell they both really love what they do, and that exuberance clearly shines through their writing. A new favorite in my quilting library! 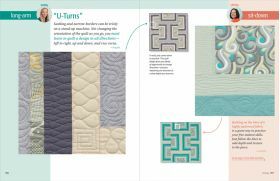 As a sit-down quilter I found so much inspiration in the book and was able to use many of the motifs shown while quilting my latest project. 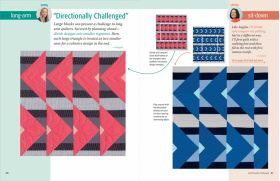 I was excited to see ideas in the long-arm sections that I find inspirational and can apply to my own sit-down quilting as well. Such a valuable resource! Christa Watson and Angela Walters are the dynamic duo of machine quilting! 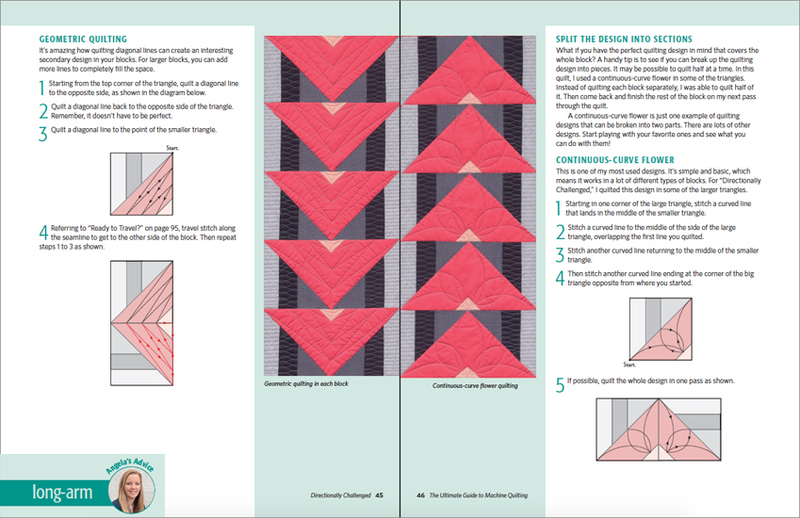 I love that this book is approached from both long arm and sit down quilting methods. No matter what your preferred method of quilting may be, there's great tips that can be applied and some fresh new ideas to try. The patterns in the book are simplistic and really lend themselves well to trying new quilting motifs and experimenting with scale. 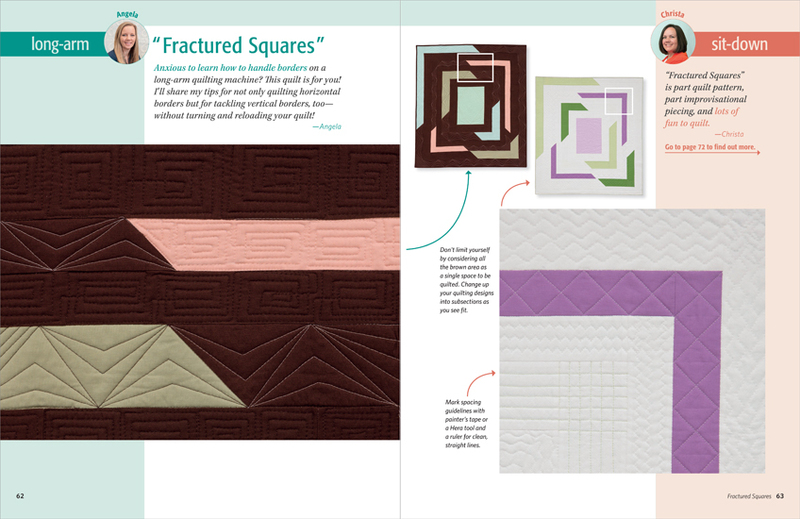 This book is a wonderful addition to any quilter's home library. This is an amazing resource for quilters of all machine shapes and sizes! 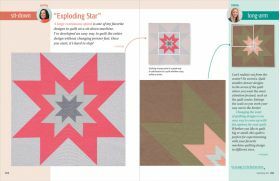 The authors offer great insight into how each of the 10 different patterns in the book could be quilted, along with an invaluable number of tips and tricks for more awkward areas that you could encounter in any quilt. One that I will be consulting regularly as I tackle my first king sized quilt on my domestic machine. This book is wonderful! I love how two quilters (one long-armer and one sit-down) take the same quilt patterns and share how they approach it. This book will be a useful part of my quilting library for many years to come! Two talented quilters offer two approaches to quilting--longarm and sit-down. 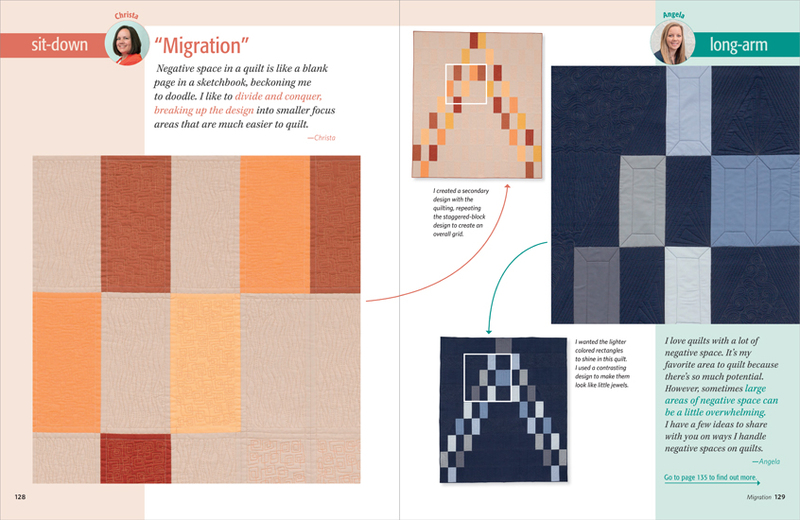 The color-coded pages show how each approaches the same quilt for finishing--and why. Basic quilt-making information and the actual quilt instructions are included for their samples. This fascinating look at the similarities and differences in approach is aptly titled. Angela Walters and Christa Watson's The Ultimate Guide to Machine Quilting: Long-Arm and Sit-Down teaches how to finish a quilt using both special and traditional sewing machines, and comes from a long-arm-quilting expert and a home-sewing-machine specialist who offer machine quilters a range of tips. More than just an instructional on using machines, this guide covers the basics of what kinds of quilting projects and stitching lends to particular machines, how to incorporate a variety of tips into a quilting effort, and how to machine quilt with better, more polished results. 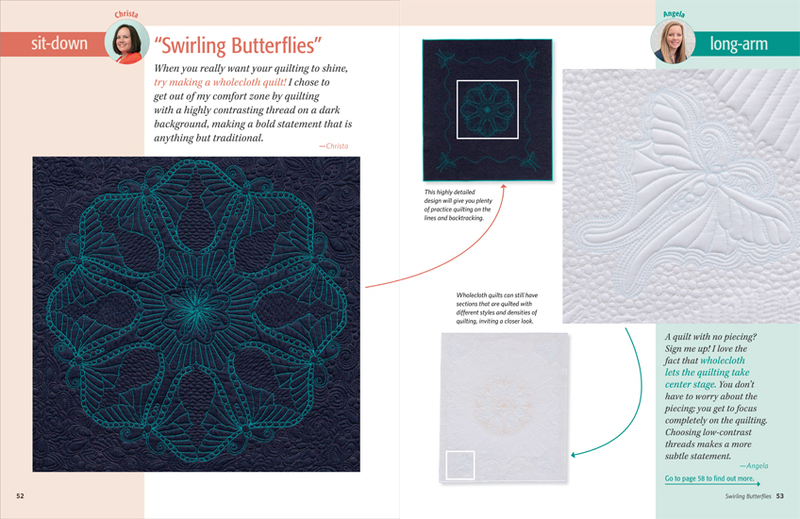 Find out why some designs and motifs are ideal for 'sit down quilting' while others are better suited to 'long-arm quilting'. 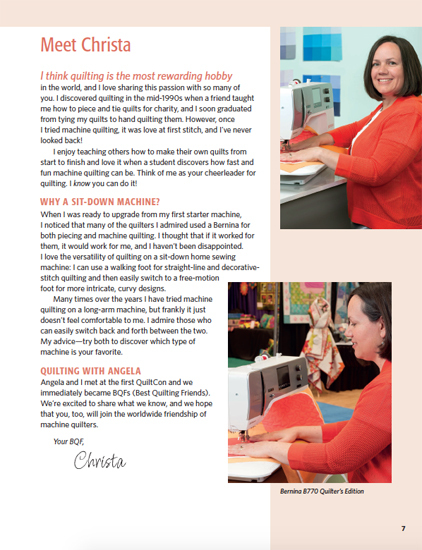 Angela and Christa are both quilting experts so with their tips, tricks and advice you will begin confidently and finish professionally as you discover how to stitch a whole range of quilting designs. There are ten quilt projects including "Fractured Squares", "Exploding Star" and "Swirling Butterflies". For each project there are two sets of instructions including cutting, construction and quilting details, diagrams and templates. They are colour coded in turquoise if you like Angela's style or orange if you wish to follow Christa. Either way you will develop many new skills! Angela Walters is a long-arm quilter, teacher, and author. Her quilting career began at the side of her husband's grandfather, and together they made her first quilt, a nine-patch design that is still on her bed today. Thousands of swirls, feathers, and parallel lines later, she has turned her love of stitches and fabric into a thriving business focused on modern machine quilting. Angela also designs fabrics. She lives on the outskirts of Kansas City, Missouri, with her husband, three children, and many, many quilts.